The post got over 800 reads and lots of positive responses. I can only hope that it leads to action. Here it is in full. A few years ago my husband, children and I packed up our gear and went off for an adventure; Four Webbs Go Mad in Dorset. 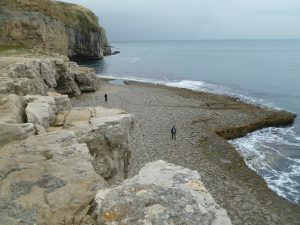 Our plan was to camp at Langton Matravers and go rock climbing at Dancing Ledge, a wave cut platform on the Jurassic Coast, near the fabulously named Scratch Arse Ware. The children had been learning to climb with the Sea Cadets (a youth organisation that gives young people opportunities for extraordinary experiences) and Jonathan and I had climbed together when we were first married, some “cough” years previously. 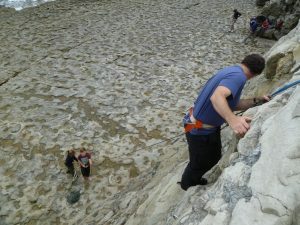 This was the first time we had climbed together as a family; and what larks we had! We were top rope climbing; a rope is fixed to the climber, passed through an anchor at the top of the cliff and then held onto by someone, the belayer, at the bottom of the cliff. Their job is to keep the rope tight so that if the climber falls they don’t fall very far. My kids belayed for each other and at one point, strapped together, they belayed for their father; what a fabulous lesson in trust. We had fun, managed danger, explored interdependence and encouraged, supported and challenged each other. It was a magical time in beautiful surroundings. Together we stepped out of our comfort zones. We literally and metaphorically climbed heights and as a result gained confidence in ourselves and each other. This kind of bonding, growing and learning is something that a good working life gives us; social interaction, the chance to try new things, learning from our mistakes, feeling supported and challenged. In contrast, I am currently working with groups of people who have been out of work for a long time – over 10 years in a few cases. For some their comfort zones are miserably small and may not even include their own home space. They have stopped growing and learning because they have stopped having opportunities to do so. The lack of the stimulation that employees take for granted, leads to limiting habits and a shrinking of perspective, hope and joy. Life is a treadmill of applying for jobs that they have little hope of getting, trying to prove to the Job Centre that they are attempting to push a load up a mountain and eking out their funds to cover the basics of life; basics that usually don’t include Christmas parties, hobbies, being able to buy a round of drinks for friends, owning a pet, running a car. Always at the mercy of bus timetables, agencies who don’t quite bother enough and potential employers who don’t quite care enough, the struggle and isolation is dispiriting. Take Aaron. He was running his own successful catering business, started from scratch, when he gave it all up to be a full time carer for his mother. When she died some years later he lost his home, his mother, his daily routine and his purpose. After a crippling few years of grief and isolation, he was facing the rest of his life with dread; no qualifications, no recent, relevant experience and serious doubts about his own value. Betty. After her husband died she didn’t leave the house for ten years. By the time she sought help, her self esteem and confidence in her own ability was through the floor. Charlie. He worked for the same employer from school, as a skilled worker, for 40 years. Now that modern life has done away with that industry, he is struggling to learn IT skills just to be able to apply for minimum wage jobs that he has no hope of getting. Debbie. A difficult childhood and time in care homes has given her rocky foundations to build her adult life on. Walking into a room with strangers is a challenge. These are not scroungers and wasters; these are people who have been dealt a poor hand and are expected to pull themselves out of the hole that they are in. Yet they don’t have the resources to do that. And those resources are not going to develop through a life of visiting the job centre, walking around town to relieve the boredom and sitting in a library, applying for jobs that they know literally hundreds of other people are also applying for. The good news is that things can get better. Betty volunteered for two years in a charity shop and on the back of that she got a job last week. Debbie was given a work taster in a supermarket and is now working there full time, blossoming and loving it. Aaron was given some basic IT help and some interview skills practice and now feels able to take on the world. What can make the difference is someone taking an interest; having a heart for them. Eric got an e-mail last week from an employer who had received his CV. A response – almost unheard of! He brought the e-mail to show us. It was written with thought and compassion and although it didn’t offer a job it was personal, wishing Eric a happy Christmas and New Year. Eric was chuffed to bits; someone had taken the time and had treated him like a person. Frank was phoned up by an interviewer to say that he hadn’t got the job and why. She also gave some feedback, unsolicited. Again, almost unheard of! Frank was amazed and the feedback was genuinely helpful. Most of the time, they don’t hear anything and they get no feedback, even when they ask. Occasionally they get treated really badly. Jobs get offered then snatched away. Jobs are filled internally but the employer has gone through a pretence of recruitment to demonstrate fairness. Georgie had to save up the bus fare to get to a job interview only to discover that the employer wanted a skilled chef, whereas the agency had sent her for a kitchen porter job. When your self esteem is at rock bottom, to be treated so badly can just confirm in you that you lack value. to give people a chance. If you can give someone a work taster for two months, two weeks, two days even, you could be the turning point for someone and the route off the treadmill. Do it for Corporate Social Responsibility reasons. Do it because you just might find a gem. Do it because you have a heart. Do it. Note: names and circumstances have been changed to protect identities. However, all these stories are real.